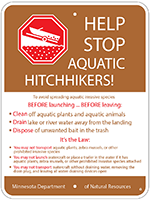 Help Stop Aquatic Hitchhikers! 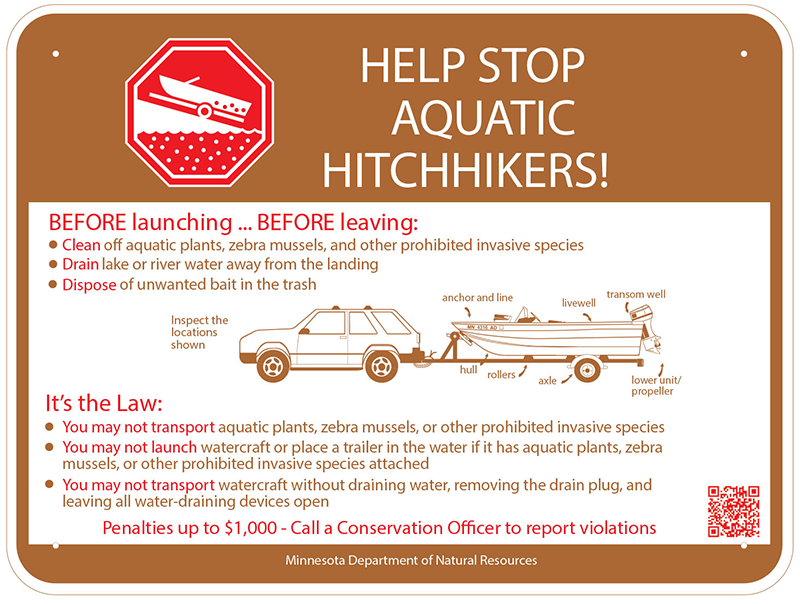 signs at water accesses are a key public awareness strategy to help prevent the spread of aquatic invasive species. 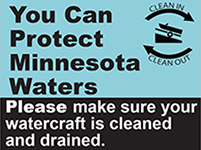 The DNR provides a limited number of these signs at no cost for lake associations, local governments, and other groups to post at water accesses. You may also print your own signs using the instructions below. Two sign sizes are available - standard and large. 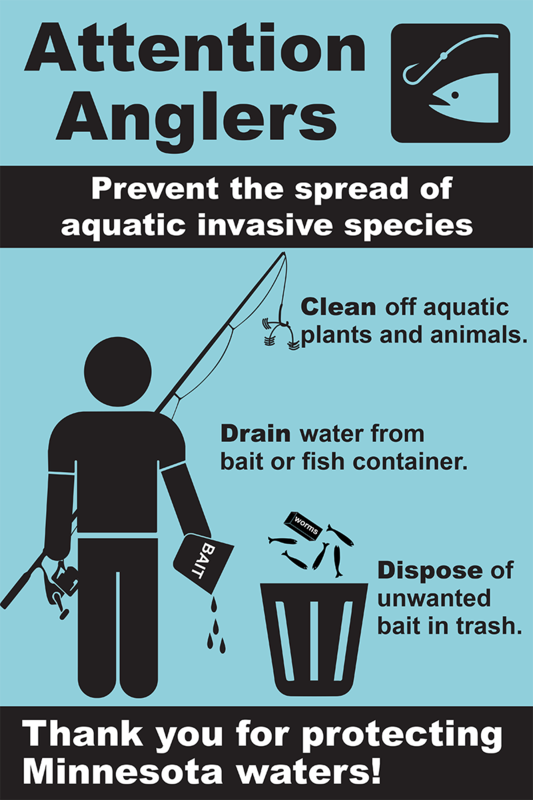 These signs can be used at both public and private water accesses on uninfested and infested waters. Standard signs are 18" x 24". Generally, two are posted at each access - one at the make-ready area and one in the tie down area. Large signs are 4' x 3' and are best suited for high-use accesses with 10 or more parking spaces. You may request up to four standard signs, or two standard signs plus two large signs, per calendar year. 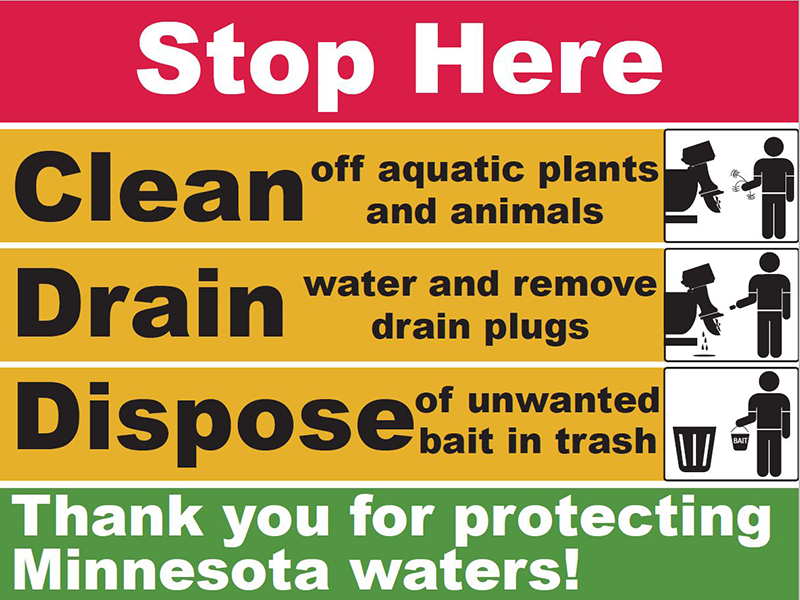 The DNR has a limited number of signs available and they will be provided to you at no cost. You will be responsible for printing and purchasing any additional signs. Receive permission from the water access owners to place signs at the access. You can find ownership information for most accesses using the Recreation Compass tool in LakeFinder. 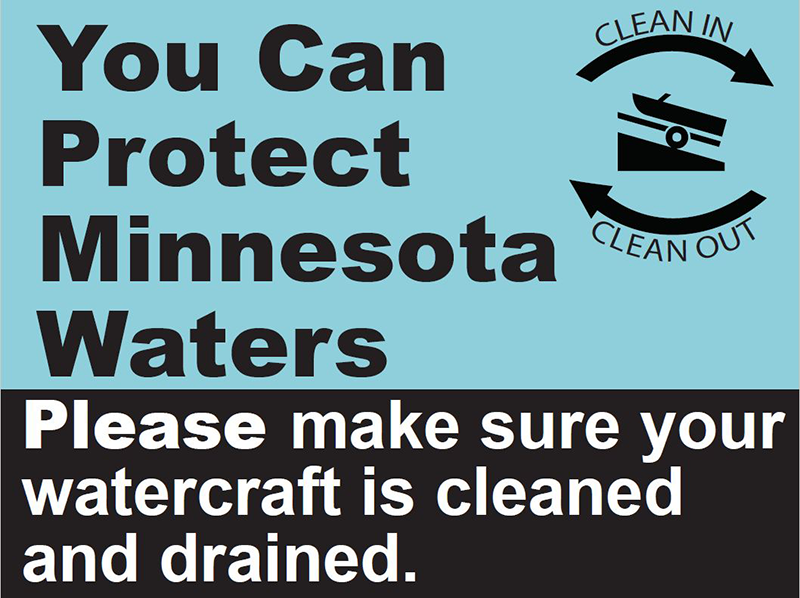 If you would like to place signs at a water access managed by the DNR, contact Nancy Stewart at 651-259-5616. Complete an application. Email, mail or fax it to your local invasive species specialist. They will contact you about sign availability. 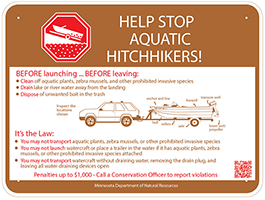 Review the Aquatic Invasive Species Sign Manual for installation guidelines. Once you have received the signs, you have sixty days for them to be installed. Sign posts and materials are not provided by the DNR. For questions on requesting signs, contact your local invasive species specialist. 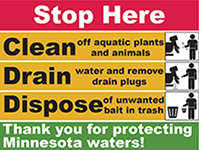 If you would like more signs than the DNR can provide, the sign artwork is available online for you to print on your own. You are responsible for the cost of printing the signs. Complete the print authorization form. Provide one copy to the company printing the sign(s). Provide an additional copy to the Minnesota Department of Natural Resources. Email an electronic copy to Tina Wolbers. Provide your printer with the artwork files. Your printer should have Adobe Illustrator software to use these files. Direct your printer to this website to download the print-ready PDF file(s). 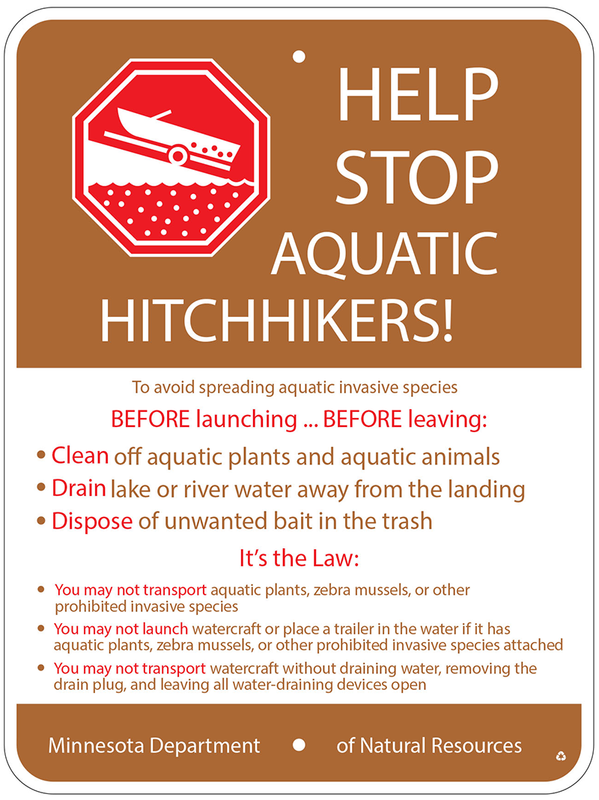 Review the Aquatic Invasive Species Sign Manual for installation guidelines. Sign posts and materials are not provided by the DNR. Local governments may request the artwork files for supplementary AIS signs. They are responsible for printing and purchasing the signs on their own. Complete the Supplementary AIS Signage Print Authorization Form. Provide one copy to the company printing the sign(s). Send an additional copy to the Minnesota Department of Natural Resources. Once the request is approved, the DNR will email the artwork files to you and the printing company. Your printer will need Adobe Illustrator to use the files. For questions on printing signs, contact Tina Wolbers at 651-259-5146.